Members are putting our voices together to thank the Congressional Democrats who succeeded in protecting good jobs and quality health care from Republicans last week. By calling 877-736-7831, we’re thanking the lawmakers who stood strong to support good jobs and quality health care for working families, seniors, people with disabilities and others–and encouraging them to hold their ground for us in the future. 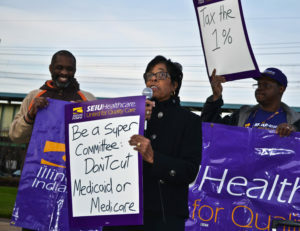 “On behalf of more than 91,000 workers united in SEIU Healthcare Illinois and Indiana, we thank Democrats in Congress for protecting Medicaid and Medicare from crippling cuts that would have endangered the jobs, the health, and in some cases, the lives of people who depend on these critical safety net programs. 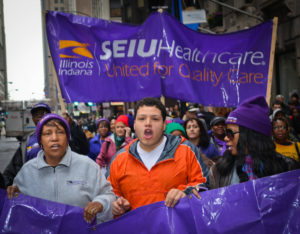 By blocking these cuts, people with disabilities can continue to live independently, safety net hospitals can remain open for the communities they serve, and health care workers will keep their jobs, preventing further deterioration in our already embattled economy,” said SEIU Healthcare Illinois and Indiana President Keith Kelleher. Now it’s our turn to thank the Democrats who stood up for us against Republicans who cater to the one percent rather than protecting jobs and healthcare for working families. These wealthy politicians aren’t done trying to cut the services we need, so we need to let our lawmakers know that we appreciate their support–and urge them to stay strong for us in the future. Take a minute now to dial 877-736-7831, state your name, your hometown, and that you’re a member of SEIU Healthcare, and that you’re calling to thank the Democrats who stood up to protect Medicare and Medicaid for working families, seniors, people with disabilities, and our children. Members and allies demonstrated on a bridge in Joliet, calling on Rep. Adam Kinzinger to put his constitutents to work. All across the country on November 17th, unions, community groups, chapters of the Occupy movement, and other diverse representatives of the 99% came together to demand support for job creation instead of more corporate welfare. 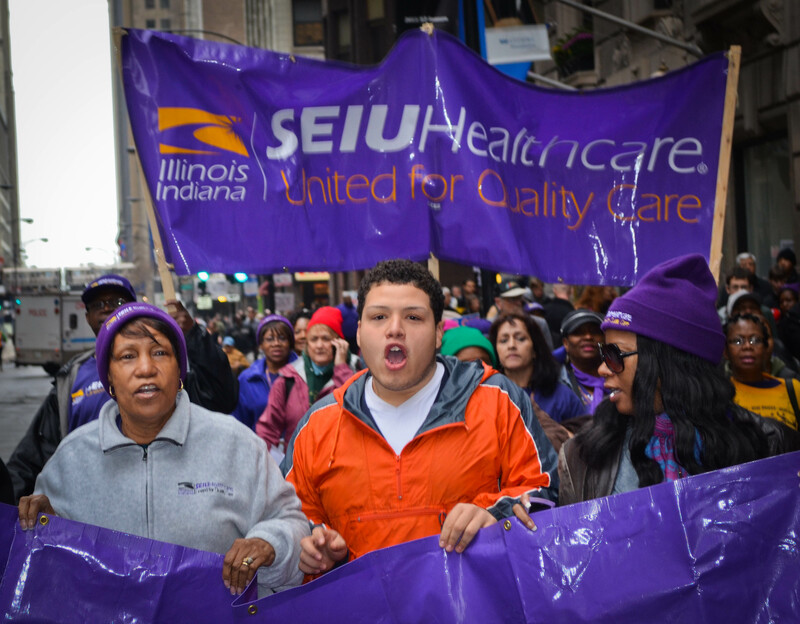 In Chicago, Joliet, and St. Louis, SEIU Healthcare members spoke, marched, and occupied bridges to speak against cuts to vital safety-net programs as hundreds of similar actions across the country made our voices even stronger. 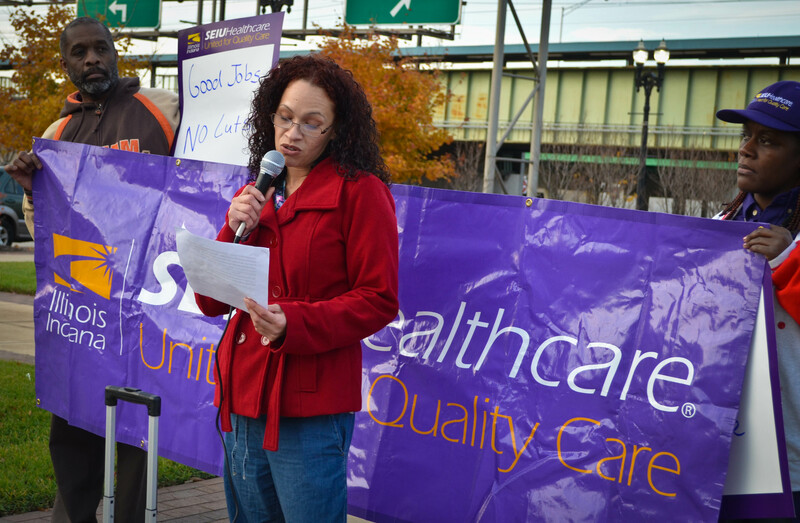 Home care worker Veronica Wansley spoke out for home care consumers on a bridge in St. Louis. “My consumer has multiple sclerosis, and she’s blind. It’s a proven fact that it would cost more to put her in a nursing home than to continue to fund the programs that allow me to help her stay safe and independent in her own home, and it would eliminate the jobs of thousands of health care workers like me. I’m here to say that Congress needs to focus on protecting jobs and safety-net programs, not tax breaks for corporations and the rich,” Veronica said. Hear more from Veronica, Ruth, and other participants at our three actions, and read more about the National Day of Action. When Ohio Governor John Kasich followed in Wisconsin Governor Scott Walker’s footsteps by signing a bill (SB5) decimating the collective bargaining rights of public sector employees, SEIU Healthcare members jumped up to stop him. Members knocked knocked on almost 7000 doors in a week to educate Ohio voters about SB5. Their efforts helped the bill to be repealed! Unlike Wisconsin’s, Ohio’s constitution allows for a citizen’s veto, giving residents a chance to bring a bad bill to a ballot–if they can gather enough signatures. With help from fifteen of our members, organizers gathered 1.3 million signatures, giving voters the opportunity to send the message that working people aren’t going to accept attacks on our bargaining rights. “These Republican governors all over the country are trying to cut out the middle class. We want the whole country to see what’s going on and say, enough is enough,” said McKinley Williams, a groundskeeper at Methodist Hospital in Gary, IN who spent a week in Cleveland knocking on doors to educate residents about the devastating impact of SB5. Excluding Election Day, Williams, Giles, and other members knocked on 6842 doors and had 2152 conversations with voters in just one week, getting support from more than 90% of them and leading 61% of Ohio voters to repeal the bad bill. As Gov. Walker’s recall heats up in Wisconsin, this victory not only protects good jobs for thousands of Ohio residents, but will have a real impact on our efforts to protect bargaining rights for working people all over the United States. Health care workers, elected officials, patients, and allies joined the growing chorus of Americans speaking out to protect vital Medicare and Medicaid funding at a rally in Gary, Indiana earlier this week. While Congress decides whether to invest in the health of working people by continuing to fund Medicare, Medicaid, and Social Security or to continue granting tax breaks to big banks and corporations, people like home care worker Vicky Hernandez are fighting hard to help Congress understand the devastating impact that funding cuts could have on some of our most vulnerable citizens. “Medicaid pays for my consumer’s medication and for me to be there to help with things like showering, eating, and going to the bathroom–things that we all take for granted. Our lawmakers don’t have to think about losing these things. They don’t realize what these cuts mean,” Vicky said. 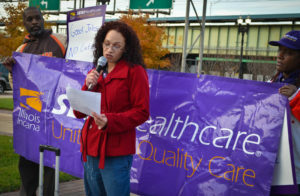 Home care worker Vicky Hernandez speaks out for her consumer, who relies on Medicaid to pay for the program that keeps her safe and independent living in her home. In addition to the impact cuts would have on consumers, Vicky and other speakers at the rally addressed the impact cuts could have on our economy. “If these cuts happen, patients will suffer. But so will thousands of health care workers who will lose their jobs. Cutting programs that keep people healthy and employed is no way to fix our economy,” said Tony Marshall, a CNA at Methodist Hospital in Gary, IN. More and more of us are getting together to tell Congress that vital funding for Medicare, Medicaid, and child care programs is the last thing they should cut. Read more about our upcoming National Day of Action and find out how you can get involved. As Congress’ supercommittee works toward a decision about how to handle our nation’s debt crisis, working people all over the country are sending the message that cutting the funding that keeps vital safety-net hospitals running isn’t the way to fix our broken economy. 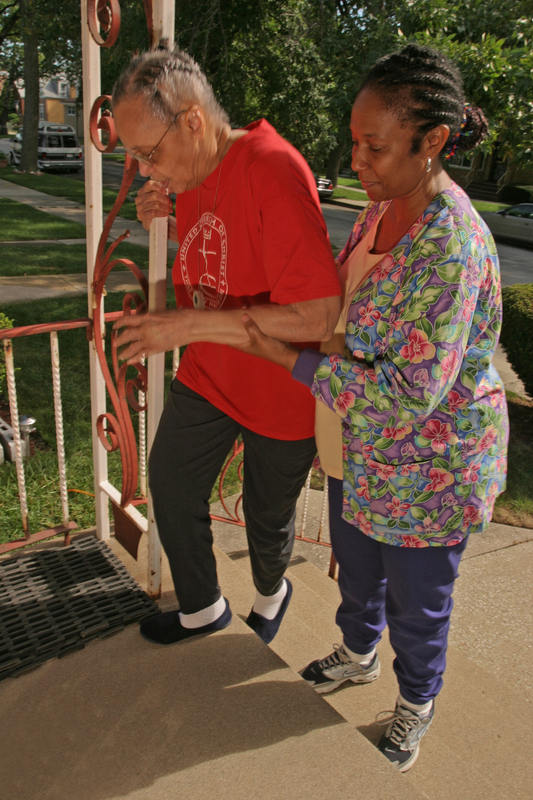 In addition to leaving low-income and elderly community members high and dry when it comes to their health, hospital closures due to Medicaid and Medicare cutbacks will put thousands of health care providers out of work–61,000 in Illinois alone. 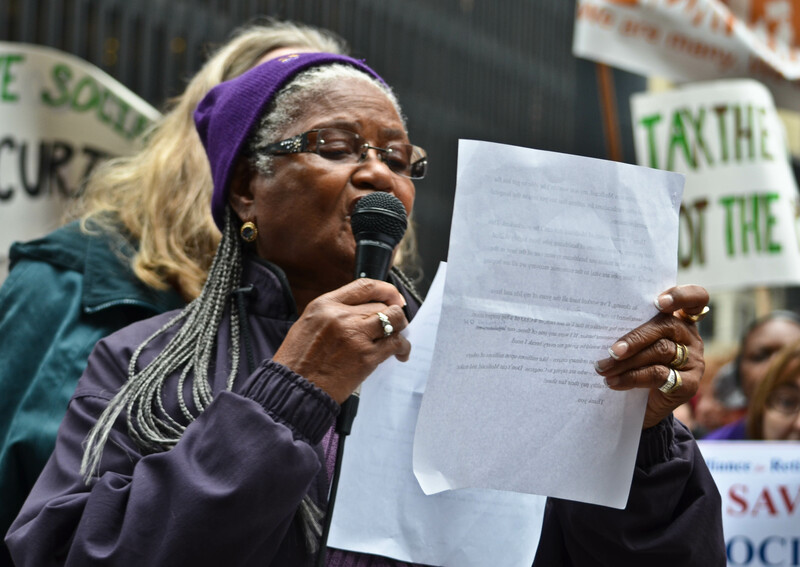 Englewood resident Frances Smith tells the crowd how the closure of St. Bernard Hospital would affect her health. 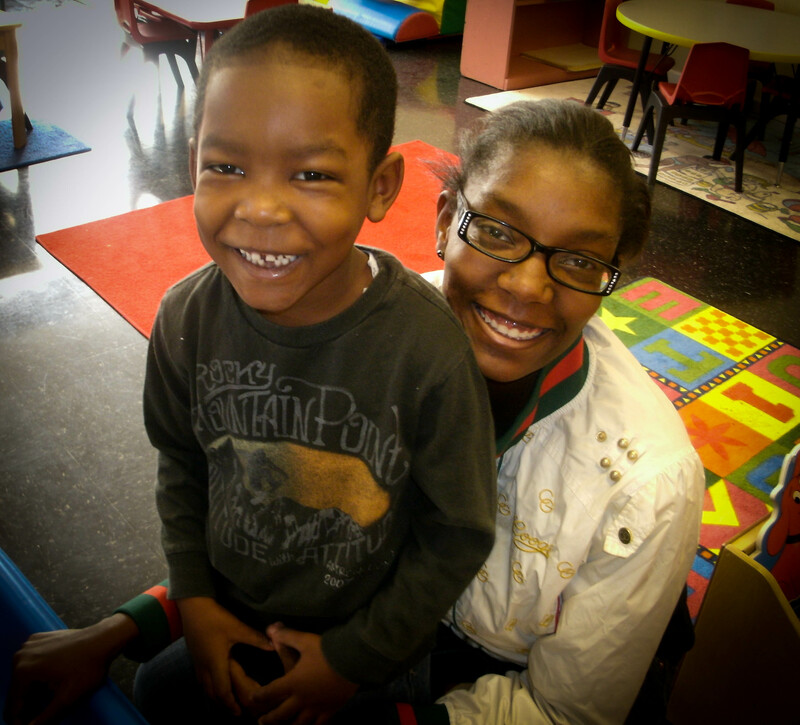 ACTION ALERT: Tell Congress what federal child care funding means to your community! Right now, Congress’ supercommittee is deciding how to reduce our nation’s looming deficit, and with it, the fate of Head Start programs that provide working families with the quality care they need to stay in school and got to work every day. Together, child care providers and consumers are working to make millionaire members of Congress understand that cuts to federal funding of state child care programs will make it harder for parents to take or keep the jobs they need to support their families as the economy struggles to recover. It’s up to us to carry the voices of working parents to the representatives making decisions that affect their lives. Please talk to your child care parents about the impact that quality child care makes on their lives and families, and share their answers with us. Traffic outside of Chicago’s Federal Plaza ground to a halt on November 7th as SEIU Healthcare Illinois and Indiana members, seniors, community, labor, and religious allies, and more gathered to urge elected officials to keep Medicare, Medicaid, and Social Security fully funded. Before nearly 50 activists were peacefully arrested for occupying the Jackson and Clark intersection, hundreds gathered in the Plaza itself to hear testimony from elected officials and from those who would be devastated by a federal budget that slashes safety-net funding. Flora Johnson spoke to defend her son's health care and independence. Home care member Flora Johnson brought her son Kenneth, who has cerebral palsy, to the action to illustrate what these programs mean for thousands of Illinois families. 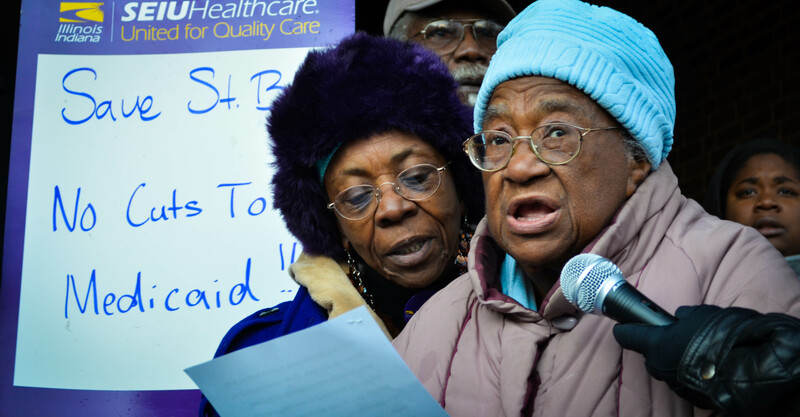 Rose Crawford, a Chicago PA, took arrest to help send the message that cutting Medicaid and other programs is bad for everyone–those who need care, those who work to provide it, and the economy as a whole. Visit our photostream to see more pictures of this event. Members took to the streets shouting slogans like "You say cut back? We say fight back!" Paid training for Personal Assistants starts this month! 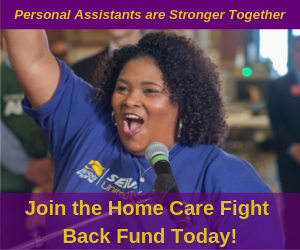 By standing together in our Union, Personal Assistants won training for the first time in our Union contract that will improve the high-quality care we provide consumers! Training is starting in November and December with hands-on classes designed for healthcare providers like us: First Aid, CPR and Defibrillator Use; Universal Precautions; and Body Mechanics and Safe Lifting. The classes will be FREE for Personal Assistants. You have the opportunity to gain these skills with the full cost paid for by your new SEIU Member Education and Training Center. PAs will receive 3 hours pay to attend most classes, but will not be paid to attend Red Cross classes. To register, call the Member Education and Training Center at 877-456-4477. Watch your mail for information about more classes starting soon!